BANGKOK, Sept 12. 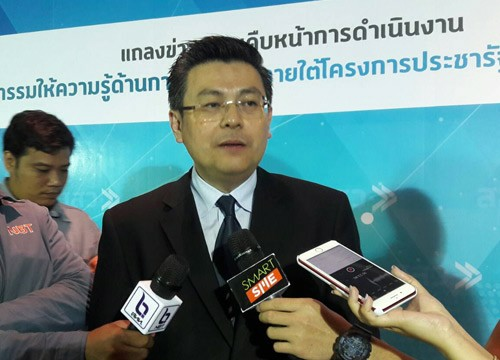 (Xinhua) -- The Office of the Small and Medium Enterprise Promotion (OSMEP) on Wednesday called on all 3 million SMEs across Thailand to adopt new technology and learn more about e-commerce as part of the government's Thailand 4.0 policy. Unveiling the latest application "SME Connect" for small and medium sized business owners, OSMEP Director-General Suwanchai Lohawatanakul reiterated the urgency for businesses to keep abreast with latest technology and innovation to target overseas market. Thailand 4.0 is the government's plan to transform the country into an innovation-driven and digitalized economy. "With fierce competition abroad, if you want to trade beyond the Thai borders, you must focus more on technology development and innovation if you want to survive at home and abroad," said Suwanchai. According to Kollakit Thalerngnawachart, director of the Bangkok based Business Network International (BNI), Thai SMEs should make use of Thailand's geographical convenience in Southeast Asia, learn to create and refine "branding" and ensure that products and services are "one of a kind" as well as "technologically up-to-date." As of 2012, there were 2.7 million SMEs contributing to 37 percent to Thailand's gross domestic product (GDP) and providing over 10 million workforces nationwide. In January 2018, OSMEP has allocated 1.2 billion baht (37 million U.S. dollars) to support their growth and estimates that the fund will help SMEs create up to 100,000 products next year to add value to the economy. The BNI will also launch a global business matching event in November, bringing 2,500 SMEs from over 70 countries to find business opportunities in Bangkok.